Probably New York’s most iconic building is on 34th St W at the junction with 5th Ave, but you can see it almost everywhere on Manhattan Island. If you take the trip up it, be prepared for lots of elevator rides and an incredible view. It’s always busy though so be prepared to wait in line. You really feel the sense of history when you go up the Empire State Building and the art deco interior is beautiful, but if you don’t want to wait in line buy Skip The Line tickets instead. Make sure you choose a really clear day before heading up the building – sometimes even when it looks clear at street level, you’ll find a haze at higher levels. There are two “observatory” levels at the Empire State Building, one on the 86th floor and one on the 102nd floor. The 86th floor is over 1000 feet high and you’ll find an indoor section and an outdoor promenade. On our last visit, we found that at dusk there were crowds five people deep struggling to get to the fence to take photos. It was a very unpleasant experience. Although we like the Empire State Building, we recommend the Rockefeller Centre instead because it’s a similar experience without the queues but with the added bonus of being able to take a photo of the Empire State Building as part of the skyline. The Empire State Building is open daily from 8am to 2am. Adult admission to the 86th floor observatory is $18.45 (2010 prices). The 102nd floor is only accessible with a ticket bought at the building on arrival for an extra charge of $15. Expect to wait in line for quite some time during your visit, unless you purchase the Express Pass at $41.52 per adult. There are several elevator rides to get you to the top and waiting times are longer at peak periods. There are a number of combination tickets you can buy to get discounted entry to the Empire State Building. 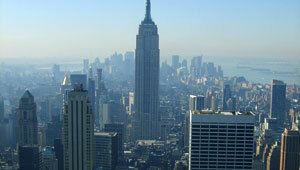 Most popular are the New York City Pass and the New York Hop-on, Hop-off Bus Tour.